Pokémon has been going through a whole year of hype, and you’d think that we’d be tired of it by now but that isn’t the case. We can see the next generation of Pokémon clearly on the horizon, and Nintendo has dutifully given us a special demo to whet our appetites. 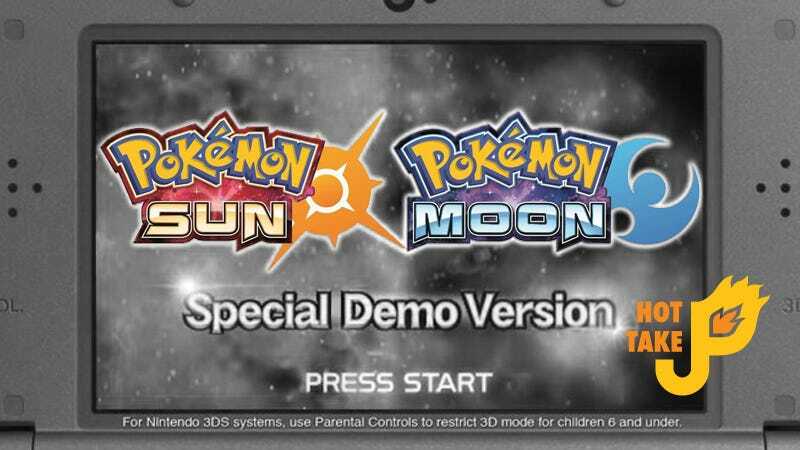 Just like with the Omega Ruby and Alpha Sapphire games, these demos have a lot more to offer than the word “Demo” implies. The Pokémon Sun and Moon Demo do their best to give you a taste of everything Pokémon. Catching (and release) Pokémon is present through a somewhat dull mini game, and you’ll get a chance to battle trainers in your initial play through (though after that, battles aren’t repeatable). The meat of the demo is the new Trials. This one has you taking photos of Jangmo-o and it’s evolution, and mixes in some battles for good measure. The amount of content is fair, a bit light but enough to get you ready for the main title. Regarding leaks and data-mines: I can’t imagine that Nintendo and Pokemon didn’t know that this was going to happen. The best they could do is make it harder for people to find. I bet they planned on doing a big announcement in the coming weeks just to show all the info that would’ve been leaked anyways. I’ve seen everything that’s been leaked, and it doesn’t take away from my enjoyment, but I can see where it can for others. I always like a demo that lets me carry stuff over to the main game, and this game is generous in that respect. The catching game I mentioned before gives you a nugget, and battling every trainer nets you something as well. But on top of that there are some events that happen at certain days after you first start that give you items as well. These minor events also help to build the world of the soon-to-be-released main games. Game Freak apparently rebuilt the engine, and with that they can now make all the humans full size instead of chibi! It’s nice and they’ve also added a lot of visually, like trainers remaining in the background during a battle. I didn’t care for the dynamic camera at points. I like it in concept, but sometimes the camera angle was more cinematic than functional. It seemed like all the areas are seperated, which I find a little dissapointing. In the original Pokémon games it felt much more open-world, but with X & Y, it seems like areas have started to be broken up. It probably has to do with the power of the 3DS. The demo does it’s best to introduce a lot of the character’s you’ll be seeing, like Professor Kukui and Hau, but if you spend a little more time in the game you’ll meet characters like Lily and even a cameo by Sina and Dexeo from Kalos. Ash-Greninja is a really cool way of referencing the anime, and the Game Freak put extra touches in to really hit it home. If you look at the Pokémon’s trainer card you’ll even see that the date it was caught is the same as the day Ash met Froakie in the anime when it aired in Japan! You’ll be able to take Ash-Greninja to the main games, though I don’t plan on using him for that play through. There you have it. I’m sure the majority of you have played the demo to some extent (this is one of the most hyped games of the year after all). And like always Game Freak, The Pokemon Company, and Nintendo have put a lot of content into the demo, as if it were a tiny decent game on it’s own. Get hype Pokémon fans and 3DS owners!